The situation: A large cattle ranch in Florida was having reproductive problems that included low conception rates, embryonic losses, abortions, and a reduced live-calf crop. Cow body condition scores were also very low. Interestingly, the problem wasn’t occurring with cattle at every grazing unit on the ranch. Some cattle were performing very well. Farm managers had looked into a number of possible causes but were not able to ascertain a good explanation. Then one of them read an article about tall fescue toxicosis and noted that the symptoms were very similar to experiences on the Florida ranch. The only problem with the diagnosis was that their ranch didn’t feed or graze tall fescue. Many of their pastures were bermudagrass. “That’s when we got involved along with Aaron Stam, a University of Florida extension agent in Lake Placid,” said Biomin America’s Paige Gott at the annual meeting of the American Dairy Science Association in Knoxville, Tenn. last month. Gott, a ruminant technical manager for Biomin, said they began looking for possible mycotoxin issues by sampling some of the ranch’s pastures in 2015. 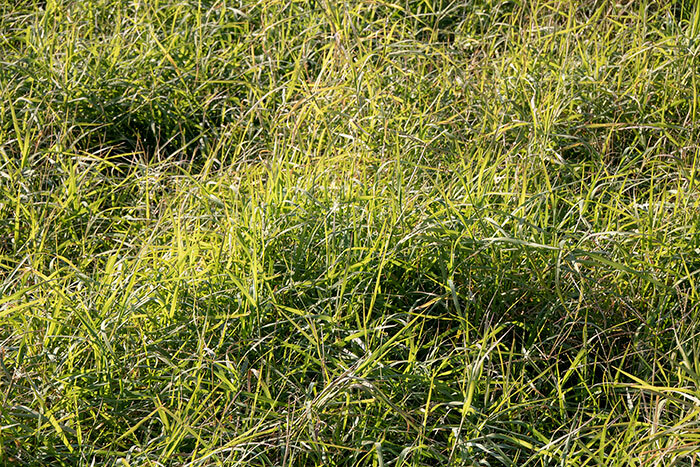 They discovered high zearalenone levels in some of the bermudagrass pastures. In 2016, all of the paddocks at the ranch were sampled. “We found that the high zearalenone levels correlated closely with those cattle that were having performance problems,” Gott said. Zearalenone is a mycotoxin with a chemical structure that mimics estrogen and can interfere with reproductive functions. To get a sense of how widespread this problem might be, Gott and Stam initiated a sampling survey of additional grass pastures. To date, nearly 400 samples have been taken and analyzed for mycotoxins. Most of the samples have come from Florida, but recently samples were received from other Southern states. The vast majority of samples have been bermudagrass, but other types of grasses have also been submitted and analyzed, including bahiagrass and limpograss. Overall, 68 percent of the bermudagrass samples tested positive for some level of zearalenone while 28 percent were below any mycotoxin detection level. Twenty-four percent of the bermudagrass samples tested positive for more than one mycotoxin. In conjunction with the pasture sampling survey, a feeding trial was conducted in two adjoining pastures on the ranch that initially had the reproductive issues. Samples were taken over time and the researchers found that there were varying levels of mycotoxins between the two pastures; there was a seasonal variation in mycotoxin prevalence as well. Interestingly, the highest levels were seen during the winter into early spring and then levels dropped off during the summer. For limpograss samples, of which 19 were analyzed, the most prominent mycotoxin tested was different than was the case in bermudagrass. Sixty-three percent tested positive for Type B trichothecenes, which includes vomitoxin. The median value for the Type B trichothecenes was 1,800 ppb. For the 17 bahiagrass samples, about one-third of those tested positive for Type A trichothecenes. The median level was 120 ppb. “Overall, we noted a lot of variability,” Gott said. “There is still much to learn. We usually don’t think about mycotoxins being a problem in pastures but based on our testing, we believe mycotoxins are contributing to the reproductive challenges that some ranches are experiencing,” she opined. The sampling survey is ongoing and the researchers are trying to expand the sampling area across a broader scope of the South. Gott indicated that they are also trying to better understand the seasonal pattern of mycotoxin levels in grasses and determine if specific mycotoxins are associated with specific grass species.